The hypothesis put forward by Fitzgerald and Lorentz was that the apparatus must contract in the parallel direction by this factor to nullify the result. But why would matter contract in the direction of motion when it experiences a velocity? All we have to do is consider that atoms and other particles behave just like waves, and have dimensions based on their wavelength (including their bond lengths). Evidence has long suggested that atoms and particles are composed of waves, have a wavelength and a frequency, akin to photons. As is well known, electrons fired through a Young double slit will interfere with one another, just like waves of light. When Schrodinger developed his model of the atom and atomic orbitals, he was building on De Broglie’s hypothesis that particles had a wavelike essence. Schrodinger’s model, which correctly predicted the shape of atomic orbitals, was based on modelling how electromagnetic waves could be constrained to form a stable 3D structure in space. This is why when Schrodinger first invented Quantum Mechanics, he called it “Wave Mechanics.” Schrodinger was an expert in hydrodynamics, the motion of fluids, which is what made him ideally situated for figuring out the orbital problem. If the reader can accept the notion that the dimensions of matter and particles depend upon their wavelength in the vein intended by the two Nobel Laureates above, and that this wavelength depends upon the speed of light, then it is simply a matter of investigating how these wavelengths would be expected to change with motion in order to understand what the physical Lorentz contraction really is. as measured in the moving frame of the particle, in the direction of motion. 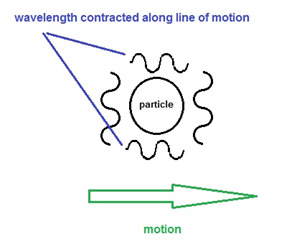 Since an atom’s size and bond length should be defined by its wavelength, if its wavelength is shorter in the direction of motion than perpendicular to it, then the moving matter will contract exactly as predicted by FitzGerald and Lorentz. This is only true of course if an atom is composed of waves and moves with respect to a preferred frame of reference for these waves. Proof of the existence of a physical Lorentz contraction would then give credence to these two former conditions. Any attempt to measure anisotropy in the speed of light in this manner will be impossible, since both the matter and the laser light will experience a wavelength contraction that will cancel out around the interferometer. 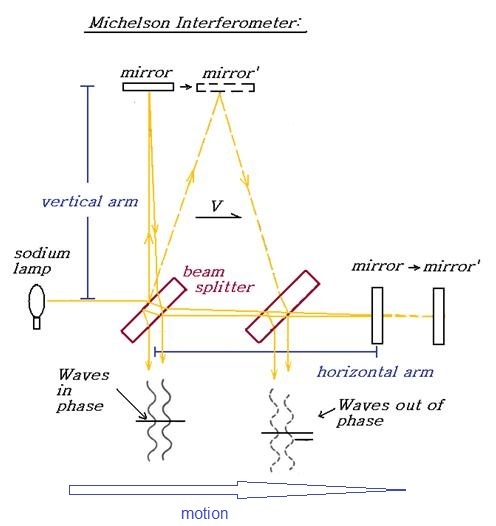 This provides an alternative explanation for why no Michelson Morley type interferometer experiment has ever been able to detect our motion through space, because this effect will lead the moving observer to erroneously measure the speed of light to be equal in all directions, regardless of this motion. Let me say at the outset, that in this discourse, I am opposing not a few special statements of quantum physics held today (1950s), I am opposing as it were the whole of it, I am opposing its basic views that have been shaped 25 years ago, when Max Born put forward his probability interpretation, which was accepted by almost everybody. (Schrödinger E, The Interpretation of Quantum Physics. Ox Bow Press, Woodbridge, CN, 1995).